Suddenly on Thursday, 23 September 2010, hours before the Lucknow bench of the Allahabad High Court was to deliver the long-awaited judgment on the Ayodhya title suit, the Supreme Court deferred the verdict till September 28; further delays are now inevitable. We are of the view that the sudden intervention by the Apex Court was unwarranted in law, and will vitiate the atmosphere for the disposal of politically or communally sensitive cases in future. In the uppermost levels of this trench, hardly 50 centimetres below the surface, were encountered rows of pillar-bases, squarish on plan and made of brick-bats sometimes intermixed with a few stones. While most of these bases were well within the trench, a few of them lay underneath the edge of the trench towards the boundary wall of the Masjid. Associated with the pillar-base-complex there were successive floors made of lime mixed with brick jelly. No coin or inscription was found on these floors but on the basis of the associated pottery and other antiquities the entire complex could be dated from the twelfth to fifteenth century CE. Attached to the piers of the Babri Masjid there were twelve stone pillars which carried not only typical Hindu motifs and mouldings but also figures of Hindu deities. It was self-evident that these pillars were not an integral part of the Masjid but were foreign to it. Since, as already stated, the pillar-bases were penetrating into the Masjid-complex, a question naturally arose whether these bases had anything to do with the above-mentioned pillars affixed to the piers of the Masjid. A summary report on the essentials of the excavations at Ayodhya was published in Indian Archaeology 1976-77 – A Review, pp. 52-53. Since the main objective of the excavation was to ascertain the antiquity of the settlement, the brief report in the Review did not make any mention of these pillar-bases. In fact, these had nothing to do with the main enquiry. In this context it needs to be added that, after a recent order of the Lucknow Bench of the Allahabad High Court, the Archaeological Survey of India carried out excavation in the area which earlier lay underneath the Babri Masjid and has discovered that the series of pillar-bases continues all over the area…. The inscription is composed in high-flown Sanskrit verse, except for a small portion in prose, and is engraved in the chaste and classical Nagari script of the eleventh-twelfth century AD. It has yet to be fully deciphered, but the portions which have been fully deciphered and read are of great historical significance for our purpose here. It was evidently put up on the wall of the temple, the construction of which is recorded in the text inscribed on it. Line 15 of this inscription, for example, clearly tells us that a beautiful temple of Vishnu-Hari, built with heaps of stone (sila-samhati-grahais) and beautified with a golden spire (hiranya-kalasa-srisundaram) unparalleled by any other temple built by earlier kings (purvvair-apy-akritam nripatibhir) was constructed. This wonderful temple (aty–adbhutam) was built in the temple-city (vibudh–alayani) of Ayodhya situated in the Saketamandala (district, line 17) showing that Ayodhya and Saketa were closely connected, Saketa being the district of which Ayodhya was a part. Line 19 describes god Vishnu as destroying king Bali (apparently in the Vamana manifestation) and the ten-headed personage (Dasanana i.e. Ravana). The inscription makes it abundantly clear that there did exist at the site a temple datable to circa 11th-12th century CE. The sculptures and inscribed slab that came out from within the walls of the Masjid belonged to this very temple. It has been contented by certain historians that these images, architectural parts and the inscribed slab were brought by the Kar Sevaks from somewhere else and surreptitiously placed there at the time of the demolition of the Masjid. This contention is absolutely baseless. Transportation of the above-mentioned material from elsewhere would have required the use of many trucks, an act which would have certainly been noticed by the innumerable representatives of the print and electronic media present on the spot to cover the event. On the other hand, a reputed journal, India Today, published in its issue dated December 31, 1992 a photograph which shows the Kar Sevaks carrying on their shoulders a huge stone-slab sculpted with a long frieze, after having picked it up from the debris. The above-mentioned historians have also alleged that the inscription has been forged.… So many eminent epigraphists of the country have examined the inscribed slab and not even one of them is of the view that the inscription is forged. Anyway, to allay any misgivings, I append here a Note from the highest authority on epigraphical matters in the country, namely the Director of Epigraphy, Archaeological Survey of India, Dr. K. V. Ramesh. … According to [Ramesh] this temple was built by Meghasuta who obtained the lordship of Saketamandala [i.e. the Ayodhya region] through the grace of a senior Lord of the earth, viz. Govinda Chandra of the Gahadavala dynasty, who ruled over a vast empire, from 1114 to 1155 CE. … The evidence presented in the foregoing paragraphs in respect of the existence of a Hindu temple in the Janma Bhumi area at Ayodhya preceding the construction of the Babri Masjid is so eloquent that no further comments are necessary. Unfortunately, the basic problem with a certain category of historians and archaeologists — and others of the same ilk — is that seeing they see not or knowingly they ignore. 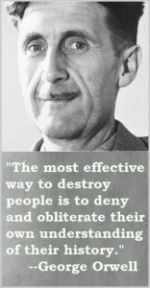 Anyway, in spite of them the truth has revealed itself. » Reprinted with permission from Rama: His Historicity, Mandir and Setu. 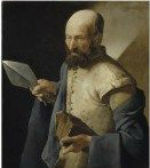 Evidence of Literature, Archaeology and other Sciences; B.B. Lal; Aryan Books International, New Delhi, 2008. 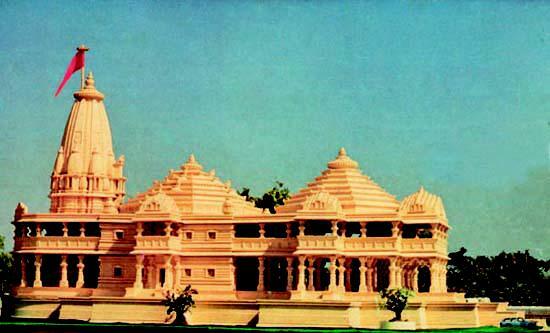 When it is obvious that the Babri Masjid has been built in place of the existing temple of Lord Ram; it is not understood why the PEACEFUL REQUEST of the Hindus – who comprise majority of the population; of building a temple of Lord Ram in the location is not permitted by the law of the land. An important aspect of the Allahabad High Court judgment in the Ayodhya title suits case is its conclusion on the issue whether a Hindu temple existed below the Babri Masjid. All three judges have answered in the affirmative and the reason is the meticulous investigation by the Archaeological Survey of India on the court’s orders in 2003. The judgment refers to that report. Given the significance of this report, it would be worthwhile to examine the evidence they gathered and their conclusions. 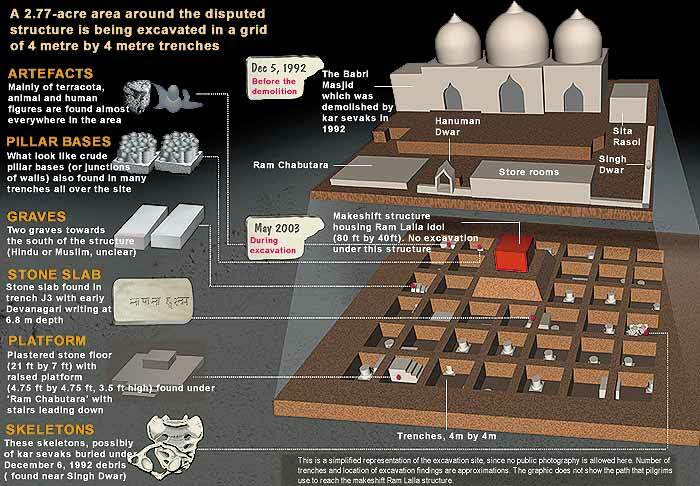 Excavation was carried out by ASI from March 12 to August 7, 2003. The court took the view that archaeological evidence would be of importance to decide the question ‘whether there was any temple/structure which was demolished and mosque was constructed on the disputed site’. It first ordered a Ground Penetrating Radar and geo-radiology survey. The Ground Penetrating Radar detected what archaeologists term as ‘anomaly alignments’. Following this survey, the court passed an order on March 5, 2003 directing the ASI to excavate the disputed site and permitted the parties to the dispute to appoint nominees to watch the excavation. The ASI excavated 90 trenches in five months and submitted its report. It states under the heading ‘The Massive Structure Below the Disputed Structure’: As stated earlier the disputed structure or structure 3 was found directly resting over an earlier construction, structure 4 (pp 33-34) which has survived through its nearly 50-metre long wall (wall 16) in the west and 50 exposed pillar bases to its east attached with floor 2 or the floor of the last phase of the structure’. Further, it said, ‘From the excavation it could be inferred that there were seventeen rows of pillar bases from north to south, each row having five pillar bases’. Under the heading ‘The Circular Shrine’ it says, ‘A partly damaged east facing brick shrine, structure …… was noticed. It is a circular structure with a rectangular projection in the east….. The structure was squarish from the inner side and a 0.04 m wide and 0.53 m long chute or outlet was noticed on plan made through the northern wall up to the end where in the lower course a 5.0 cm thick brick cut in ‘V’ shape was fixed which was found broken and which projects 3.5 cm outside the circular outer face as a pranala to drain out the water, obviously after the abhisheka of the deity…. ‘The brick shrine is similar (Fig 18) on plan to the Chirenath brick temple at Sravasti exposed recently by the Archaeological Survey of India ………..It has also affinity with circular Siva temples of Rewa in Madhya Pradesh at Chandrehe and Masaon belonging to C 950 AD and a Vishnu temple and another without deity at Kurari in Fatehpur district of Uttar Pradesh and Surya Temple at Tindali in Fatehpur district… Thus on stylistic grounds, the present circular shrine can be dated to tenth century AD… They possibly brought the tradition of stone circular temples transformed into brick in Ganga-Yamuna valley’. The Northern Black Polished Ware (NBPW) using people were the first to occupy the disputed site at Ayodhya during the first millennium BC. This period may be assigned to circa 1000 BC to 300 BC. The Sunga horizon (Second–First century BC) comes next in order of cultural occupation at the site. “Typical terracotta mother goddess, human and animal figurines….represent the cultural matrix of this level”. The Kushan period (first to third century AD) followed the Sunga occupation. The advent of Guptas (fourth to sixth century AD) is represented by the typical terracotta figurines and a copper coin. During the post-Gupta-Rajput period (seventh to tenth century AD) too the site witnessed structural activity including a circular brick shrine. Though the structure is damaged, the northern wall still retains a provision for pranala (waterchute). Finally, the ASI summed up its answer to the question put to it by the court, namely ‘whether there was any temple/structure which was demolished and a mosque was constructed on the disputed site’, as follows: ‘Now, viewing in totality and taking into account the archaeological evidence of a massive structure just below the disputed structure and evidence of continuity in structural phases from the tenth century onwards up to the construction of the disputed structure along with the yield of stone and decorated bricks… amalaka, kapotapali doorjamb with semi-circular pilaster, broken octagonal shaft of black schist pillar, lotus motif, circular shrine, having pranala (waterchute) in the north, are indicative of remains which are distinctive features associated with the temples of north India”. This report played a crucial role in determining a crucial issue before the court. At this point, it would be pertinent to revert to proceedings before the Supreme Court in regard to the presidential reference of January, 1993 and to the declarations and assertions by the Union government before the apex court on how it proposed to resolve the dispute. A five-judge Bench of the Supreme Court on October 24 1994 delivered its judgment in the Faruqui case (M Ismail Faruqui and Others Versus Union of India and Others) while simultaneously disposing of the presidential reference made the previous year. In that reference the president asked the court: “Whether a Hindu temple or any Hindu religious structure existed prior to the construction of the Ram Janma Bhoomi–Babri Masjid (including the premises of the inner and outer courtyards of such structure) in the area on which the structure stood?” The court declined to answer this question. In the Faruqui case, the constitutional validity of Acquisition of Certain Area at Ayodhya Act, 1993 was challenged. The court upheld the Act but declared Section 4(3) of Act, which provided for abatement of all pending suits and legal proceedings pertaining to the disputed structure, to be invalid. This meant the revival of all pending suits and legal proceedings before the Allahabad High Court. On the Presidential Reference, the court said it was “superfluous and unnecessary and does not require to be answered”. The judgement pertained to the constitutional validity of the ‘Acquisition of Certain Area at Ayodhya’ Ordinance on January 7, 1993 for acquisition of 67.703 acres of land in the Ram Janma Bhoomi–Babri Masjid complex and the reference made by the president that very day to the Supreme Court under Article 143 of the Constitution. Those who opposed the presidential reference said the question was ‘academic’ and ‘vague’ and did not serve any constitutional purpose. The Supreme Court asked the solicitor-general to clarify. The solicitor-general responded with a written statement on behalf of the central government on September 14 1994. He said the government would treat the finding of the court on the question of fact raised in the presidential reference “as a verdict which is final and binding”. The government would make efforts to resolve the controversy by a process of negotiations “in the light of the Supreme Court’s opinion and consistent with it”. The solicitor-general further went on to say that if efforts at a negotiated settlement did not succeed, “government is committed to enforce a solution in the light of the Supreme Court’s opinion and consistent with it. Government’s action in this regard will be even-handed in respect of both the communities. If the question referred is answered in the affirmative, namely, that a Hindu temple/structure did exist prior to the construction of the demolished structure, government action will be in support of the wishes of the Hindu community. If, on the other hand, the question is answered in the negative, namely, that no such Hindu temple/structure existed at the relevant time, then government action will be in support of the wishes of the Muslim community”. The solicitor-general’s statement formed a part of the record and was taken into account by the court. The Supreme Court however held that the presidential reference was “superfluous and unnecessary” in view of its decision to uphold the validity of the Acquisition of Certain Area at Ayodhya Act, 1993, except Section 4(3). Now that the Allahabad High Court has concluded that there indeed was a temple below the disputed structure, the Union government is bound by the commitment made before the Supreme Court on September 14 1994. It now has the answer to the question it posed via the presidential reference and will be morally and legally bound to live up to its commitment. Several commentators who are not clued into the intricacies of Hindu law have expressed surprise over the high court’s verdict, especially on the juristic rights of deities exercisable through a ‘next friend’ and on the court’s eventual conclusion that Ram Janma Bhoomi is the birthplace of Ram. Of the four title suits decided in the Ayodhya case, only one filed on behalf of Bhagwan Shri Ram Virajman was accepted by the court. All the other suits (filed by Sunni Waqf Board and others; Sri Gopal Singh Visharad and Nirmohi Akhara) were dismissed. In the suit filed on behalf of Ram, Bhagwan Sri Ram Virajman was the first plaintiff, the second was Asthan Sri Ram Janma Bhoomi, Ayodhya (the place known as Ram Janma Bhoomi) and the third plaintiff was Deoki Nandan Agarwal, a retired judge, who became the ‘next friend’ of the deities in 1989. Following his demise, T P Verma and then Trilokinath Pandey were appointed the ‘next friend’ by the apex court. 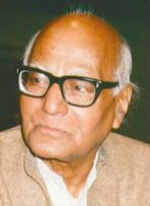 K N Bhat, former additional solicitor-general who represented Lord Ram and the Janmasthan acting through the ‘next friend’ Pandey argued that a Hindu deity is a juristic person who can sue and be sued and can possess properties and that this is well-established through judgments of the Privy Council and the Supreme Court; that the Janmasthan is itself a deity; and that the suit is not barred by limitation because the deity (Lord Ram) is in the position of a perpetual minor. The final outcome depended substantially on whether the court accepted these points. Quoting from Mukherjea’s Hindu Law of Religious and Charitable Trusts, the plaint said Lord Ram was a ‘juristic entity’ with a juridical status. “Its (the deity’s) interests are attended to by the person who has the deity in his charge and who in law is its manager, with all the powers which would …be given to the manager of the estate of an infant heir. 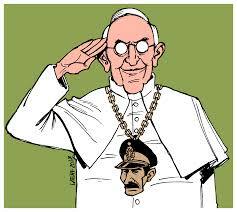 This doctrine …is firmly established”. Such a deity, deemed to be a perpetual minor, can sue through a ‘next friend’ appointed by the courts. As regards Lord Ram’s place of birth, the contention was that Asthan Sri Ram Janma Bhoomi (the place itself) was an object of worship as a deity and it personified the spirit of the divine. The asthan (the place) thus had a juridical personality of its own even before construction of the temple and installation of the idol, which is not necessary for invoking the divine spirit. Other examples of places sanctified by belief even though there is no idol are Kedarnath, Vaishno Devi and Gaya. The plaint also quoted extensively from the gazetteers to establish the fact that Hindu belief in Lord Ram’s birthplace had been acknowledged by many authorities over several centuries. The evidence adduced on behalf of these plaintiffs included Ajudhia in Historical Sketch of Tehsil Faizabad, by P Carnegy, officiating commissioner and settlement officer. Carnegy states that Janmasthan marks the place where Sri Ramchnadra was born and goes on to add that “Ajudhia (Ayodhya) is to the Hindu, what Mecca is to the Mohomedan, Jerusalem to the Jews…” . These gazetteers, written by British officers, are seen as having considerable evidentiary value. The court said the suit filed on behalf of the deities was not barred by limitation and that the premises in question (or any part thereof) were by tradition, belief and faith the birthplace of Ram. Justice Sudhir Agarwal said the area covered by the central dome of the disputed structure “being the deity of Bhagwan Ram Janamsthan and place of birth of Lord Rama as per faith and belief of the Hindus, belongs to plaintiffs (Suit 5) and shall not be obstructed or interfered in any manner”. 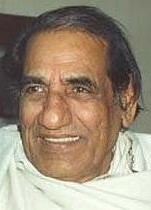 Justice Dharam Veer Sharma also concluded that Lord Ram’s place of birth was a juristic person and a deity and that the ASI had proved that the disputed structure was built after demolition of a “massive Hindu religious structure”. Justice Sibghat Ullah Khan also opined that Hindus treated/believed that the birthplace of Lord Ram was situated in that area and granted the place where at present the idol is kept in a makeshift temple. Given the eventual outcome of this long drawn dispute, devotees of Lord Ram owe a debt of gratitude to Deoki Nandan Agarwal, whose efforts from 1989, when he became the ‘next friend’, has in many ways clinched the issue in favour of Lord Ram and Ram Janma Bhoomi. Jay Shri RAM . . . .
Varanasi: A group of Muslim women of Varanasi has come out in open support of Babri Masjid case litigant Mohammad Hashim Ansari, who is no more keen to pursue the matter and wants “Ram Lalla to be free”. These women have also submitted a petition to MP and Prime Minister Narendra Modi requesting construction of Ram Mandir in Ayodhya. Supporting Ansari’s assertion, they said, “The construction of Ram Mandir would end hatred and strengthen Hindu-Muslim unity and harmony.” These women are also planning to travel to Ayodhya to meet Ansari. Muslim Mahila Foundation president Nazneen Ansari along with Bharatiya Awam Party Najma Parveen and others submitted the petition with Modi’s local office in Ravindrapuri Colony on Thursday. The petition was also sent to RSS chief Mohan Bhagwat and senior RSS functionary Indresh Kumar. “Yadi Musalman apni tarakki chahate hain aur Hinduon se izzat chahate hain to Ram janmbhoomi par mandir nirman ke liye pahal kare kyunki duniya janti hai Ayodhya Sri Ram ki hai, (If Muslims want prosperity and respect from Hindus, they should take lead in constructing temple at the birthplace of Ram, as the world knows that Ayodhya belongs to Sri Ram),” said Nazneen adding that construction of temple would permanently resolve the hatred between the two communities. “Ram se yudh karne wale Ravan ko logon ne aaj tak maaf nahi kiya toh Ram mandir todne wale Babar aur uske samarthakon ko log kaise maaf karenge, (When people have not forgiven Ravana for fighting with Ram, how can they forgive Ram Mandir destroyer Babar and his supporters)”, wondered Nazneen. Describing Babar as Mongol invader, she wrote that his ancestor Halaku killed thousands of Muslims and Khalifa in Baghdad in 1258, and Babar sowed seeds of hatred by destroying Ram temple in 1528. “Everybody knows that Indian Muslims have no connect with Mongols,” she said adding that those who oppose the construction of temple were not well wishers of Muslims. Bharatiya Awam Party president Najma Parveen said that time was ripe for Muslims to set an example of communal harmony by contributing to the construction of Ram Mandir. “No one can play with the sentiments of crores of Hindus attached with Ram,” she said. Muslim women associated with MMF and BAP had openly campaigned for Modi during the parliamentary election. Besides, these women had also sent Rakhi to Modi on the occasion of Rakshabandhan and prayed for his well being during the holy month of Ramzan. NEW DELHI: The role played by “independent experts” — historians and archaeologists who appeared on behalf of the Waqf Board to support its claim — has come in for criticism by one of the Allahabad High Court judges in the Ayodhya verdict. While the special bench of three judges unanimously dismissed objections raised by the experts to the presence of a temple, it was Justice Sudhir Agarwal who put their claims to extended judicial scrutiny. Most of these experts deposed twice. Before the ASI excavations, they said there was no temple beneath the mosque and, after the site had been dug up, they claimed what was unearthed was a mosque or a stupa. During lengthy cross-examination spread over several pages and recorded by Justice Agarwal, the historians and experts were subjected to pointed queries about their expertise, background and basis for their opinions. To the court’s astonishment, some who had written signed articles and issued pamphlets, found themselves withering under scrutiny and the judge said they were displaying an “ostrich-like attitude” to facts. He also pointed out how the independent witnesses were all connected — one had done a PhD under the other, another had contributed an article to a book penned by a witness. read the ground penetration radar survey report that led the court to order an excavation. She did her PhD under another expert Shireen F Ratnagar. Verma and Jaya Menon alleged that pillar bases at the excavated site had been planted but HC found they were not present at the time the actual excavation took place. Archaeologist Shereen F Ratnagar has written the “introduction” to the book of another expert who deposed, Professor Mandal. She admitted she had no field experience. “Normally, courts do not make adverse comments on the deposition of a witness and suffice it to consider whether it is credible or not, but we find it difficult to resist ourselves in this particular case considering the sensitivity and nature of dispute and also the reckless and irresponsible kind of statements…” the judge has noted. He said opinions had been offered without making a proper investigation, research or study in the subject. The judge said he was “startled and puzzled” by contradictory statements. When expert witness Suraj Bhan deposed on the Babri mosque, the weight of his evidence was contradicted by anotherexpert for Muslim parties, Shirin Musavi, who told the court that Bhan “is an archaeologist and not an expert on medieval history”. Justice Agarwal referred to signed statements issued by experts and noted that “instead of helping in making a cordial atmosphere it tends to create more complications, conflict and controversy.” He pointed out that experts carry weight with public opinion. “One cannot say that though I had made a statement but I am not responsible for its authenticity since it is not based on my study or research but what I have learnt from what others have uttered,” Justice Aggarwal has said, emphasising the need for thorough original research before concurring with what someone else has claimed. A patient comes to a doctor for a second opinion because his previous doctor’s advice is “not convenient” to her; the second doctor dies not do any independent study of the patient’s clinical history or investigation reports, but reading only the previous doctor’s remarks, makes a statement that he agrees with the treatment advice. Will the patient, logically, have got an independent, unbiased second opinion on the matter? Does she now have two independent experts advising her the same treatment, giving her the requisite confidence to go ahead with the treatment? If, instead, the new doctor contradicts the previous doctor’s advice without performing any independent inquiry, is his advice more credible, or merely more convenient? I believe, these are evidences of how corrupted we have become as a society. For security reasons, comments have to be made in English. The famous Sri Arunachaleswarar temple at Tiruvannamalai has come under a security blanket following an anonymous letter threatening attack on the devotees, particularly foreign visitors. The police department has erected metal detectors and engaged around 50 police personnel in and around the temple from Friday. The temple’s joint commissioner received the letter on Thursday which stated that the temple, devotees to the temple and foreigners in the town would be attacked when the verdict of the Ayodhya case is pronounced. The anonymous letter, posted from the Thenimalai area in the town, also challenged the police department to arrest the senders if it could. Devotees are allowed inside the temple after a thorough check. “Police have also been put on regular beats around the temple and important places,” said the SP. The police have also conducted thorough checks in lodges, hotels and alerted ashrams in and around the town to look out for suspicious-looking persons.